Oodles is providing blockchain app development services since the inception of the technology in the enterprise ecosystem. Blockchain brings transparency, creates trust, and secures data in business operations. Companies prevent their records from tampering and revision using this revolutionary technology. 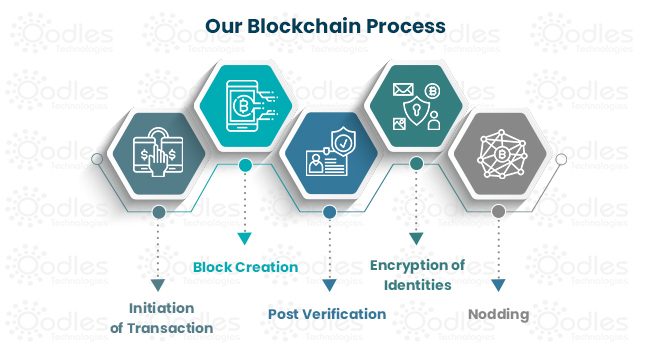 For more details on exploring the possibilities of blockchain applications in your business,connect with Oodles Technologies’ skilled blockchain applications developers. We strive to provide advanced end-to-end blockchain solutions in diverse industries. With blockchain based services, businesses achieve fast and secure peer to peer transfers of data. Why Hire Our Blockchain Application Developers? Oodles Technologies is one of the fastest growing blockchain development companies in India. We create high-octane web and mobile applications based on Blockchain technology. Blockchain experts at Oodles navigate the clients right from the ideation, integration, to implementation of blockchain in business. We offer a variety of blockchain development services to improve businesses and expedite the adoption of decentralization. Apart from the blockchain development and consultancy services, we assist our clients in other areas of IT as well, like ERP, big data, artificial intelligence, machine learning, live video streaming and more.